Sir (Samuel) Luke Fildes (1843-1927) was a major English illustrator and painter. He was born in Liverpool, the son of a shipping agent. He attended evening classes in art at the Mechanics' Institute, Chester, and moved to London in 1863 having won a scholarship to study at the Government Art Training School, South Kensington; an institution linked to the South Kensington Museum, now the V&A. He went on to study at the Royal Academy Schools. He started his artistic career as an illustrator, with a strongly realist style based on direct drawings from nature. When Fildes began to exhibit oil paintings he quickly developed a radical form of "social realist" painting, combining the campaigning subject matter of contemporary journalism and novelists such as Dickens - the urban poor and the effects of industrialization - with the scale and rhetoric of traditional history painting. 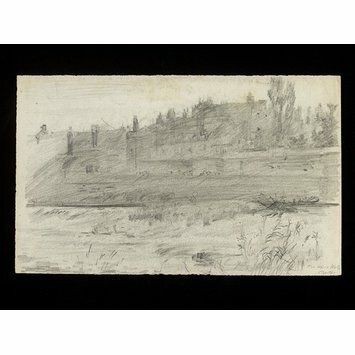 This drawing is one of 265 works acquired by the museum through descent from the artist (museum numbers E.451-715-2003). The V&A is the principal repository of Fildes's drawings, having received major gifts in 1971, 1977 and 1987. The bequest of 1971 (E.580-981-1971) was from the son of the artist, Sir Paul Fildes, O.B.E., F.R.S. Sir Paul had compiled a Catalogue raisonné of the published reproductions of Luke Fildes's drawings, revised in 1965, but which remained unpublished; a typescript of this is in the National Art Library (formerly E.981-1971, now L.5859-1975, pressmark 86.W.71). This provided much information about the works which made up the gift. The bequest of 1977 was from Mrs Kitty Whittaker-Ellis, daughter of the artist (E.1704-1804-1977), and that of 1987 came via another daughter, Mrs Cedric Ripley, (E.65-142-1987). The 2003 gift similarly descended from the family and ranges from slight sketches, to worked up designs, probably for Fildes's published illustrative works. 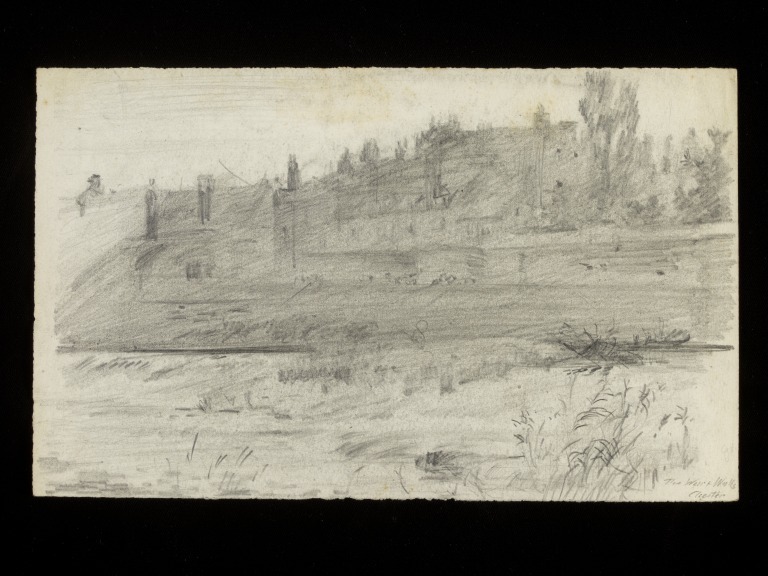 Pencil sketch of the medieval walls of the city of Chester, attributed to Luke Fildes (1844-1927), Great Britain, ca. 1860-1927.